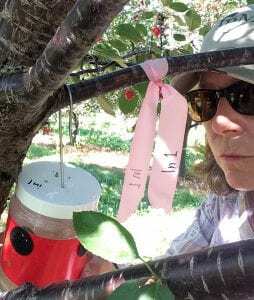 SWD caught in traps set in tart cherry : Spotted Wing Drosophila Latest information from the NYS IPM Program. SWD was caught in three of seven tart cherry orchards we are monitoring, during the week ending July 6. All three of these sites are near Lake Ontario in Wayne County. Inland sites in Wayne and Ontario Counties have yet to catch SWD. Harvest dates were projected to be one to three weeks out. However, the heat of late has brought fruit to ripeness faster than expected. Fruit is at high risk of infestation because it is now ripe and soft. We will continue trapping at these sites through harvest. For SWD management in Michigan tart cherries, monitoring with SWD traps is used to determine when SWD is in the orchard. Once SWD is found, it is time to initiate a spray program to protect tart cherries, regardless of the number caught. Collecting a Scentry trap to check for SWD in a tart cherry orchard. Mostly females were caught — a somewhat typical pattern, wherein females are caught first. For best results, sprays should be applied at 7 day intervals. If it rains, apply an insecticide as soon as possible after the rain. Refer to the insecticide quick guide for tree fruit. A recap of efficacy (days-to-harvest) for insecticides labeled for use on tart cherry against SWD; strikethrough on materials with likely too long a preharvest interval. Fair to Poor – Grandevo (zero days) This biological may prove useful in close rotation (3 days) with excellent materials, such as Entrust to bring you up to harvest. This is how it is being used in commercial blueberry production in NJ. Mowing row middles every other week was found to significantly reduce SWD infestation over no mowing in Michigan. Trees were unsprayed and 3 gallons of fruit sampled at harvest for SWD larvae showed, on average, 100 larvae in unmowed orchard setting versus 25 in the mowed orchard; a 75% reduction. Test fruit pressure? In plums, if fruit was greater than 3.5 lbs pressure it wasn’t susceptible. If less than 3.5 lbs pressure it was susceptible to SWD.